Fill your home or office with the delicious aroma of fresh popped popcorn! Contemporary H-D® Metallic Flames Popcorn Machine features smoked glass panels with frosted Bar & Shield graphics and borders. Side-hinged 4 oz. kettle pops ninety-two one-ounce servings per hour. Matching black cart features custom cut, brushed metallic bar & Shield flames graphics, chrome serving shelf and handle, and black rubber wheels. Easy assembly required for cart only. Popcorn Machine w/ Cart sold as a set. 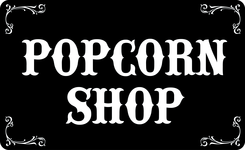 Popcorn Machine also available individually.